January 29, 2016, Mumbai: Mahindra & Mahindra Ltd. (M&M Ltd.), India’s leading SUV manufacturer today announced the launch of Mahindra Sparsh, a first of its kind kiosk for service workshops. This unique industry-first interactive service application has been designed for the convenience of customers of Mahindra’s personal range of vehicles (Thar, Bolero, Xylo, Quanto, Verito, Verito Vibe, TUV 300, Scorpio, XUV 500, and Rexton). 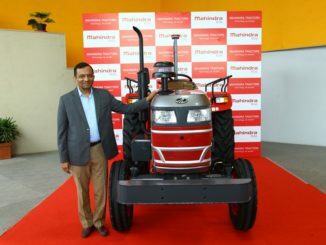 The first Mahindra Sparsh facility was launched in the Mahindra Dealership Workshop – Global Gallarie, Thane, Mumbai. Developed to enhance customer experience, Mahindra Sparsh aptly creates awareness and educates the customer on the various service offerings and key features of the vehicle. The various features and icons of Mahindra Sparsh can be bucketed under the following: Know Your Vehicle Better / Estimate Your Vehicle Service Cost / Be A Smart Owner / Workshop Uniqueness / Drive Smart / Genuine Spares And Accessories / Rate Your Service Experience / Refer A New Customer And Win / With You Hamesha. To elaborate further, Mahindra Sparsh educates the customers on the need for regular servicing and the key features in their vehicles, brings transparency with respect to the cost of scheduled services through menu pricing, highlights the best offerings of workshops, busts common service related myths, showcases all Mahindra vehicles under one roof, promotes genuine parts and accessories by highlighting its advantages over spurious spares and accessories and promotes value added services (Maxicare) to customers. Further Mahindra Sparsh also educates the customers about various smart driving habits through specially created videos. Mahindra Sparsh is scheduled to be installed in all Mahindra Workshops across India in a phased manner.